Zestos: Enabling life through communication of research: Hearing loss - preventable and reversible ? Was asked a few days ago about age related hearing loss and if there were any nutrients that would help prevent or even reverse this process. The first thing we should cover is wear decent ear muffs or ear plugs. You can purchase very cheaply very high quality earplugs from your local health and safety store, go for the highest grade they have. I use air plugs that are designed to be worn at airports. Use them always in places were it is loud. This includes, parties, concerts (ok I go for less noise reduction at concerts), using any power tools such as lawn mowers, chainsaws, buzz saws. Even heavy traffic noise, tractors idle or working can damage your ears. The rule of thumb is if you struggle to hear a normal conversation you should be wearing ear protection. This means most people in bands (both classical and electric) should be wearing air protection and as you can expect there are air plugs designed especially for musio's. The other thing to remember is that noise hearing loss is noise loudness and how long you have the noise. Therefore a loud thunder clap may cause a small amount of damage but a 8 hour shift in a somewhat noisy factory is much worse. This means if you are going to listen to loud music, enjoy a song or two, then turn the volume down so you don't do damage to your ears. A great graphic and article is found here. Don't forget some sounds, for example hammering in a closed space or kids yelling next to a wall reflect the sound which greatly increases the sound volume, hence wearing air protection is needed. If in doubt wear your plugs/muffs. When you are older you will reap the benefits. Now onto age related hearing loss. 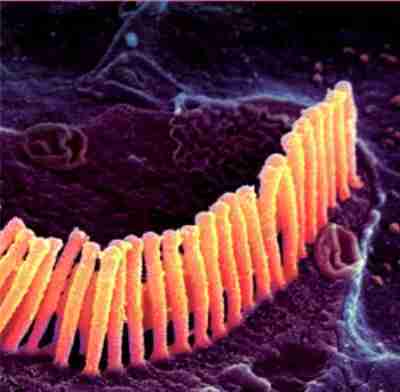 You hear by sound vibrating small hairs in your inner ear. These vibrations are picked up by nerves which then send the signals to the brain. These hairs are shown in the false color electron microscope picture to the left As people age they loose the hairs that vibrate and thus they loose hearing, this process is called presbycuis. The higher frequencies are lost first. This loss of frequency can occur from the 20's onwards, but most people are not aware of there hearing loss until if affects their lifestyle eg can't hear little johnny (kids have higher pitched voices than adults) or some other annoying hearing loss. Two thoughts spring immediately to mind. The first is that free radical damage / antioxidants are likely to be involved and the same thing that causes hair loss on your head, or other body parts, may be involved. According to Wikipedia things that reduce oxygen delivery to the hair follicles cause increased hearing loss. This includes heart disease (Atherosclerosis causes reduction in blood flow to all parts of your body), diabetes which can cause thicker "skin" around the hair follicles reduction their effectiveness.So antioxidants prevent heart disease therefore would indirectly prevent hearing loss. Also antioxidants and magnesium directly protect against noise induced hearing loss. I am also aware that lack of B vitamins are associated with hair loss. Between the antioxidant nutrients and B vitamins we have nearly all the vitamins. Hence I have compiled a list of the nutrients that may help prevent age associated hearing loss. Low vitamin B12 and foliate were associated with more hearing loss in older women. Vitamin C and vitamin E help prevent age related hearing loss. Lack of vitamin D is also associated with increased hearing loss. Other B vitamins have not appeared to be studied in relation to hearing loss. So in conclusion - keep you cells healthy by high antioxidant intake along with optimal vitamin intake will help prevent hearing loss. Rebamipide (300 mg/day), alpha-lipoic acid (60 mg/day), and vitamin C (600 mg/day) were given orally for at least 8 weeks to 46 patients..... Hearing levels after treatment were significantly improved at all frequencies. Rebamipide is a drug that acts as an antioxidant and the use in improving hearing is a off label use eg it has not been robustly tested for improvement of hearing and thus the effects are not well documented. Before I would try this I would try having 300IU's of vitamin E, general multi carotene and Co-enzyme Q10 as these may have similar effect. Another study looked at feeding carnitine to rats. They feed rats at 50 mg/kg l-carnitine for 30 days. Carnitine works in your cells as an antioxidant and in process of fatty acid transportation. The dose for humans would be different from that in rats. Therefore I suggest you visit a health food shop and read the label on the carnitine, I would go for the higher recommended dose.Also you must us the l-carnitine instead of d-carnitine. Both the l and the d carnitine have the chemical make up but the d has a different shape to the l molecule and thus the d-carnitine is completely biologically inactive so will have no effect. As a quirk it has been noticed that one of the side effects of being under general anesthetic may improve hearing, however no one has yet determined why this is and how common this occurs! Removal of ear wax may also help. I often wear ear plugs. 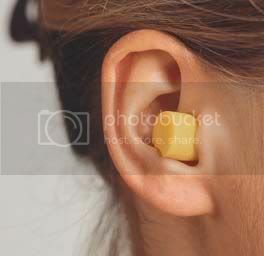 This prevents the natural removal of wax from my ears. Over time this builds up, I get the ear wax removed by suction every few years. This is normally precipitated by a airplane flight as lots of wax can inhibit ear decompression. After was removal I notice a distinct improvement in the high frequency hearing. So in conclusion prevent age related hearing loss by eating lots of high antioxidant foods, suppliment with lots of antioxidants and these may also improve your hearing loss.